As of Odn, values are now “elastic”. The defaults (3000) are now baseline values. This will predictably change based on conditions during flight. This results in a much more responsive and connected feel. This also reduces the potential for MTO, and other unwanted flight characteristics, stemming from having Q as a fixed value. This should require less tuning than previously. In Caprica, this was per-axis. Now its combined into 1 setting. This is the amount of data that’s used in determining the automatic Kalman filter tuning. The higher W is the more data is looked at for a determination of filter settings. W@32 is ~1ms of data or 32 samples. W@64 is ~2ms of data or 64 samples. Larger quads 6-8″ will probably fly better with W@64+ and 10″ and above W@128+. reboots the Spring FC into USB mode allowing you to download the Blackbox faster than the GUI. There are corresponding “R” values, and while you may see them in Butterflight/Betaflight, it is dynamic in ours and will be removed from the CLI soon. This is similar to the previous “dyn_gain” setting except applies directly to our fully dynamic Kalman implementations and is applied per-axis. 100+ is an alternative Dynamic Kalman we are also testing. Once we have determined which is the most appropriate for the majority of users, we will be simplifying this option. Default is 10. 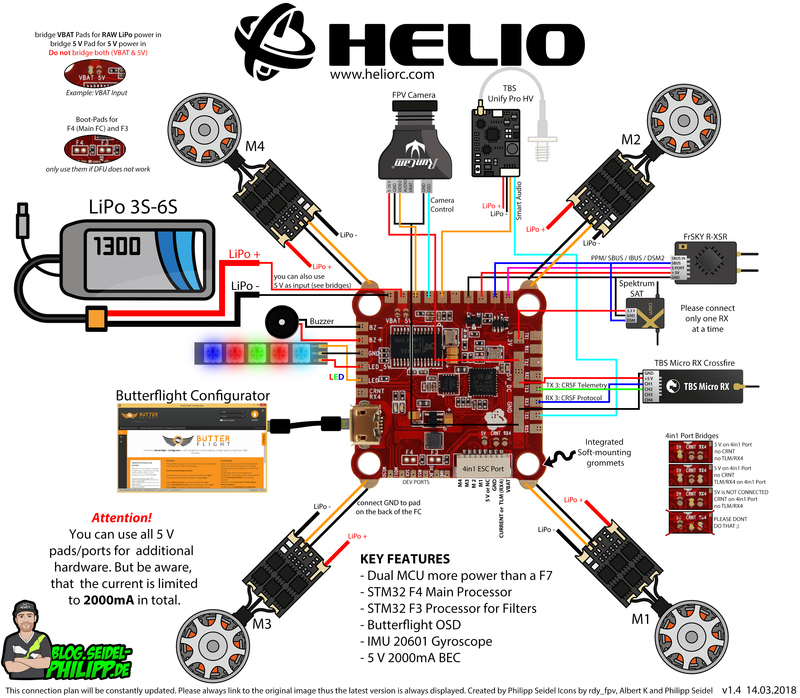 Because the flight code no longer has to filter any gyro input, PID response to stick inputs and set-points is faster. Eventually, we will have all of these values automated. We hope to make every quad plug and play. What the Spring FC allows us now is the headroom to be able to add those features. We want everyone flying to spend more time flying and less time tuning and having to worry about all the little details.